2 The Dim Sum method (廣式擘酥). 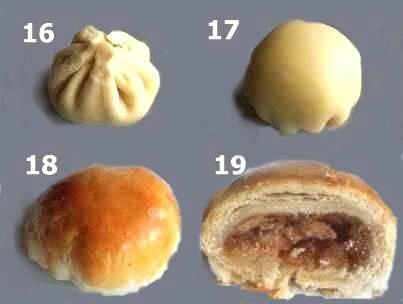 Pastry made with Huaiyang method pastry are more common and can be found in streets and shops, whereas the Dim sum-style pastry are more of a speciality and usually only found in dim sum restaurants. 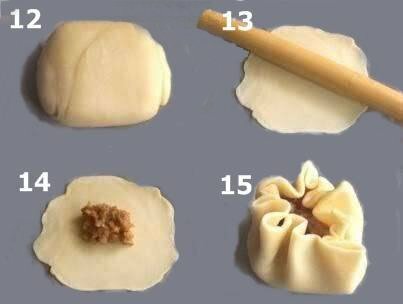 The Huaiyang method flaky pastry is the generic layer found in Chinese pastry. It is also easier and quicker to make than the Dim Sum method. 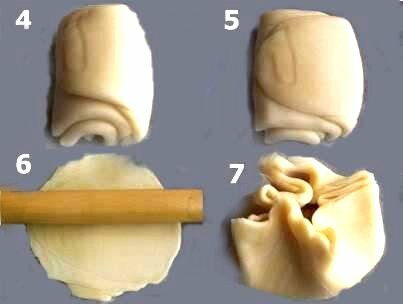 The Dim Sum method flaky pastry is more comparable to the western puff pastry where it is more time consuming to prepare. 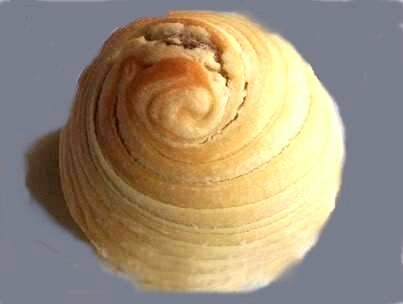 2.The other the lard or shortened dough (油酥麵皮). The basic water dough consists of flour, water and lard in the proportion of roughly 5 : 2-2.5 : 1-1.25 depending on recipes. In some recipes, a little bit of sugar or salt is added for flavour, but traditionally no flavouring is added. Although lard is the traditional fat used, shortening, butter or margarine, or even liquid cooking oil could also be used instead of lard. The lard dough consists of flour and lard in the proportion of roughly 2 : 1. 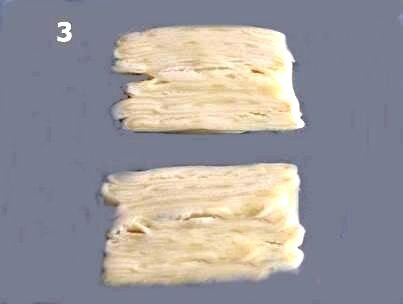 After the water dough and lard dough are mixed separately, the lard dough is wrapped inside the water dough, then the combined dough is layered by rolling and folding similar to making puff pastry. 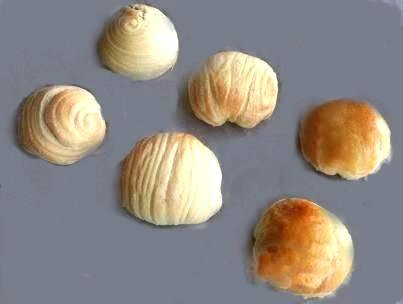 Two methods are used to accomplish the layering of the dough, the large-scale method (大包酥) or the small-scale method (小包酥). The large-scale method is quick and able to produce a larger quantity in a shorter time frame but the resultant layers are not as distinct and delicate. The small-scale method is slow and more suitable for preparation in domestic homes in small quantity, but it produces a more distinct and delicate layering effect. With the hidden layering, the layering cannot be seen on the outside of the end product, as the layering is in the cross-section. This is the easiest and most common method for beginners. The half-hidden layering is one where only half of the layering is visible on the outside of the end product. As the name implies, the visible layering is one where the layering can be seen on the outside of the end product. 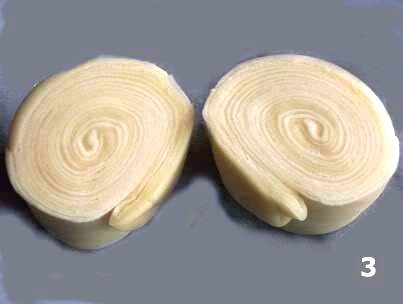 Within the visible layering, there are spiral layering (圓酥) and parallel layering (直酥). 1. First make the water dough and lard dough separately according to recipe. Divide the water dough and lard dough into small equal portions according to the recipe. Take a piece of water dough and a piece of lard dough. Roll out the water dough into a flat circle. Place the rounded lard dough in the centre of the flat circle. 2. Gather the outer edges of the water dough circle and wrap up the lard dough ball. 3. Pinch and seal the edges. 4. With the heel of your palm, gently press the dough down to flatten it lightly. 5. Using a small rolling pin, roll out the dough. 8. 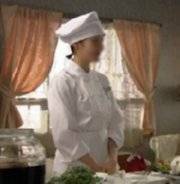 Turn the rolled dough 90 degrees. 9. Roll out the dough again. 11. Cover the dough and rest for 15 minutes and then it is ready for filling and shaping. 12. With the heel of your palm, gently press the dough down to flatten it lightly. 13. Roll out the dough. 14. Place filling in the centre. 15. Gather the outer edges of the dough circle and wrap up the filling. 16. Pinch and seal the edges making sure the seal is tight. 17. Turn the dough upside down so the sealed end is underneath. 18. Egg wash the surface if desired and bake or deep-fry according to recipe. Small-Scale Method up to step 11. 3. The cut surface reveals the spiral layering. 4. Turn the dough so the cut surface is facing downward. 6. Roll out the dough. 7. Place filling in the centre. 8. Gather the outer edges of the dough circle and wrap up the filling. 9. Pinch and seal the edges making sure the seal is tight. 10. Turn the dough upside down so the sealed end is underneath. will destroy the layering effect). 2. 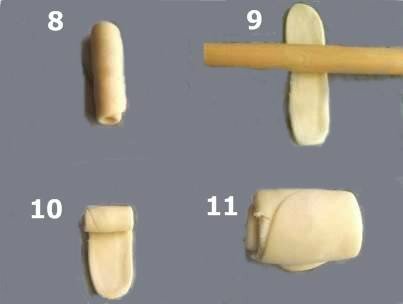 Cut the dough lengthways into two pieces. 3. The cut surface reveals the parallel layering. and wrap up the filling. 8. Pinch and seal the edges making sure the seal is tight. 9. Turn the dough upside down so the sealed end is underneath. 1. 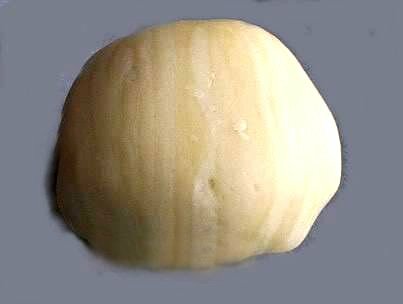 For the water dough: put flour, salt, sugar and ghee in a mixing bowl, slowly add just enough water to form a soft but non-sticky dough. Knead until smooth, form into a ball, cover and put into the refrigerator for about 20 minutes before using. 2. For the short dough (oil based): mix all ingredients and knead into a soft dough. If it is too soft, chill in the refrigerator to harden a bit. If it is too hard, knead it a bit more until you get soft dough about the same flexibility as the water dough. 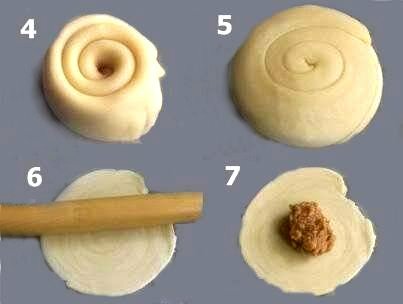 It is important that the pliability of the short dough should be about the same as the water dough when making the spiral pastry. 3. 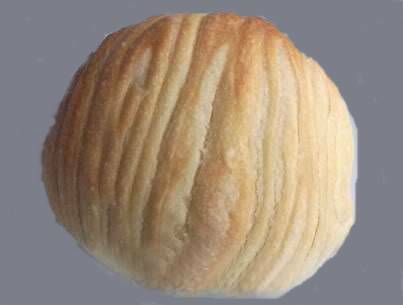 Take the water dough out from the fridge, knead briefly and form into a ball. Cut a cross halfway through the dough ( no1). Press the four quarters of the dough out (no 2) and pin it out into a sheet using a rolling pin. Put the short dough, shape into a rough square to fit, in the middle of the pin-out water dough (no 3). Fold the overlapped water dough to enclose the short dough, seal the edges (no 4). 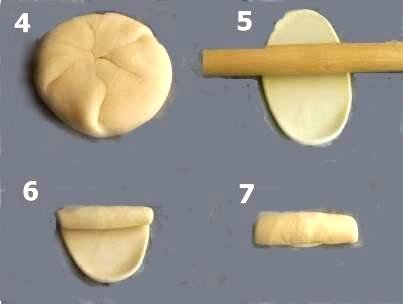 With the rolling pin, press down the dough in a crisscross fashion to flatten the dough (no 5) then roll it out ( no 6). Fold the top 1/3 of the dough down ( no 7) and the bottom 1/3 up to get three layers (no 8). Turn the 3-layer dough 90° ( no 9) and repeat the pressing, rolling and layering process (no10, 11, 12 and 13) three more times. Press the dough down in the crisscross fashion again and pin it out to get a thin rectangular sheet ( no14) or trim the edges to get a perfect rectangle. 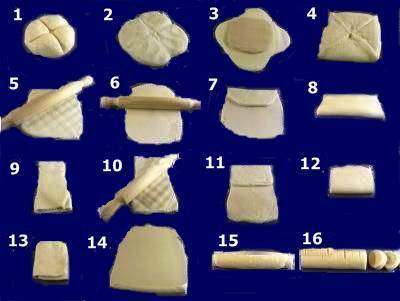 Roll it up Swiss roll style and divide the roll into 24 portions. 4. Take 2 portions of the finished dough, flatten with your palm and roll them out into 2 spiral discs respectively. Put about one heaped tablespoon of the filling in the middle of one of the disc and cover it with the other disc, making sure the side with the clearer spiral lines is facing outward. Pinch and seal the edges, with the aid of a little water if necessary. With your thumb and forefinger, work along the edges by pinching and folding a rope edge all the way around. Repeat with the rest of the dough pieces and filling.